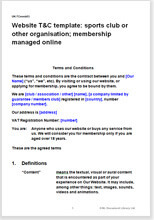 This T&C template governs the use of a website that provides membership based services. It could be a trade association, a buying club, a sports club or a social club. The essential feature is that you permit applications for membership via the Internet. Your successful applicants pay a subscription via the Internet, and you provide some services at a price or free. They could be anything at all. The document assumes that your members can interface heavily with your website and therefore provides very strong contractual protection relating to acceptable use and removal of offensive content. These aim both to dissuade your members from mis-use or malicious use of your site, and to give you additional protection from claims relating to the actions of, or content posted by, your members. This template has been written to cover international use because sites that would use such a template are likely to attract visitors from across the world. It has been written to comply with the Republic of South Africa law, but is likely to be enforceable in many other legal jurisdictions too. protect your business from complaints about content that your subscribers posted particularly important if your members can contribute content to your site that you might not moderate in real time. If your site is used only by businesses, look at Website terms and conditions template: member services for businesses. If your site is for the general public, use Website terms & conditions template: membership based services.